Marine Adhesive Sealant - - 3M™ Marine Adhesive Sealant 5200 for Comfort House items P2425 Boat Documentation Plaque and P2630 Solid Oak Boat Documentation Plaque. Three-ounce tube. Coast Guard regulations state that your documentation number must be permanently affixed to the vessel so that "alteration, removal, or replacement would be obvious." In addition, when the official number is on a separate plate, the plate must be fastened in such a manner that it's removal would normally cause some scarring of, or damage to, the surrounding hull area. Comfort House recommends coating the back of your documentation plate with 3M Marine Adhesive Sealant 5200 and then screwing the plate to a stringer or bulkhead where it would be readily visible for inspection and also make for a permanent installation. In many recreational boats the plaque is commonly placed near the hatch in the engine compartment. 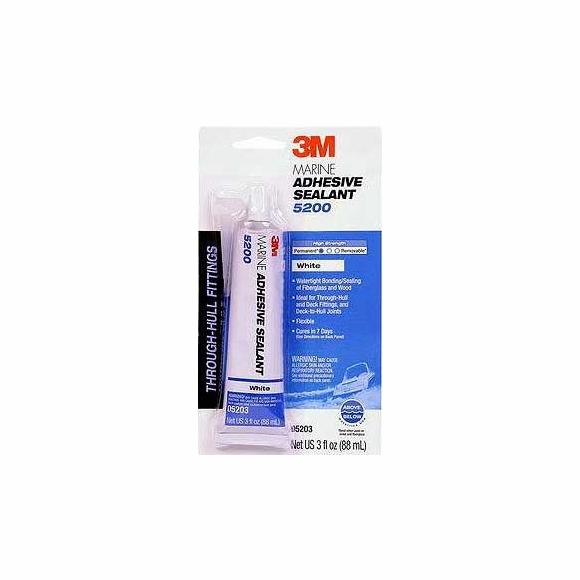 3M Marine Adhesive Sealant 5200 is extremely strong and retains its strength above or below water line. Stays flexible, too, and allows for structural movement. Has excellent resistance to weathering and salt water. This 3-ounce tube provides adequate adhesive for your Comfort House documentation plate with some left over for your other nautical jobs. Also referred to as our boat documentation plaque glue.